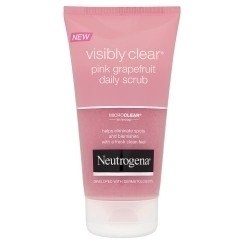 Neutrogena Visibly Clear® Pink Grapefruit Daily Scrub helps eliminate spots and blemishes with a fresh clean feel. Lovely grapefruit scent and nice texture, help to remove the old skin pieces and makes the skin nicer and softer. Not bad price, would buy one that was lower priced for better effects though. Scent is alright and beads are not too rough. Nothing wonderful about it, is a good scrub and that is about it. There are better products out there that have more effects, but if you want just a scrub, this will do. "Lovely grapefruit scent and nice texture, help to remove the old skin pieces and makes the skin nicer and softer."